Before a first date, it's completely normal to experience nervous jitters. Meeting someone you're interested in and being unsure of how the date will go is sure to cause a bit of anxiety and make you feel a bit less confident. We've all heard that we should make eye contact when we're talking to others, but it can still be difficult to do. Making eye contact shows that you're relaxed and confident in what you're saying and that you're listening attentively. If you have trouble maintaining eye contact in conversations, luckily there are methods to help you out. First of all, it's important that you're relaxed. Eye contact should feel natural and the more relaxed you are, the more genuine it will feel. If it's easier for you, it's a good tip to focus on an area around the eyes instead of looking directly into them. This way, it will appear as if you're looking into your date's eyes, but it won't feel as intimidating. 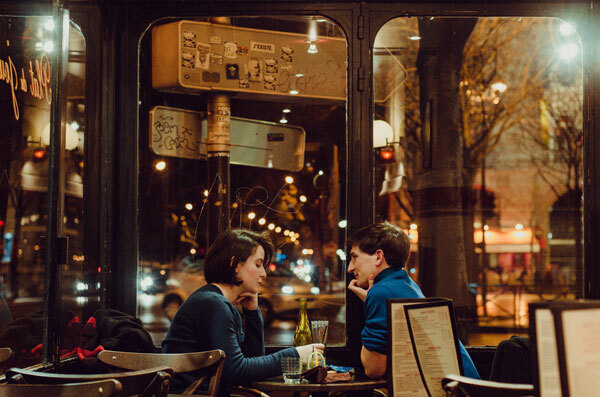 Eye contact will help you connect better with your date and will allow you to feel more confident about your conversation. Before you head off to your date, take steps while you're getting ready so that you're feeling confident. If you're wearing an outfit and have a haircut and shave that make you feel good, you'll likely feel better about yourself. With your outfit, make sure to wear something that's comfortable and you feel good in. It's important to wear something that fits you properly so you won't be fidgeting throughout your date. Of course, you should also make sure to wear an outfit that's appropriate for where your date will take place. If you're meeting somewhere you haven't been before, look it up online to figure out what is expected of visitors to wear there. It's completely understandable to feel nervous before your date, but if all you can think about is how nervous you are, you won't be able to relax and feel confident. Remember that all this date is, is a conversation with someone you're trying to get to know better. Don't put too much pressure on it! When you're on your date, focus on being in the moment and truly being involved in the conversation. Your date will appreciate you being involved, which will make it much easier for her to relax as well. Put your focus on her instead of on your internal worries so you can truly get to know her. If you're worried about awkward pauses in conversation, prepare ahead of time by considering topics of conversation and questions to ask. I'm not saying to have note cards ready with topics, but before seeing each other, think about what you'd like to learn about your date. This will give you an idea of what questions to ask and how you can relate your life back to what you know about her. It's also important that you're not taking over the entire conversation. Many people tend to babble on when they're nervous, so be aware of how much you're talking and if you're giving your date enough time to ask questions and share about herself. This will make it much easier to have the conversation flow naturally and you'll feel more confident in how the date goes.